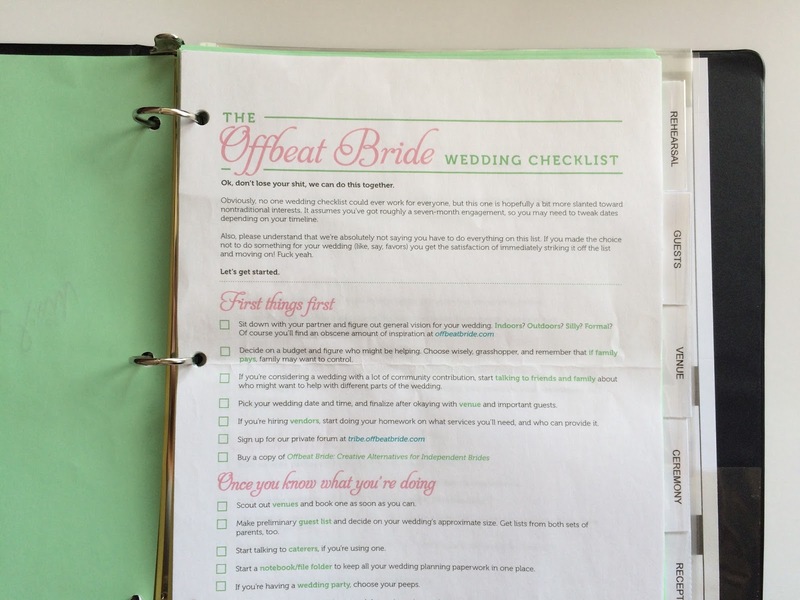 I finally bit the bullet and put together my wedding binder. 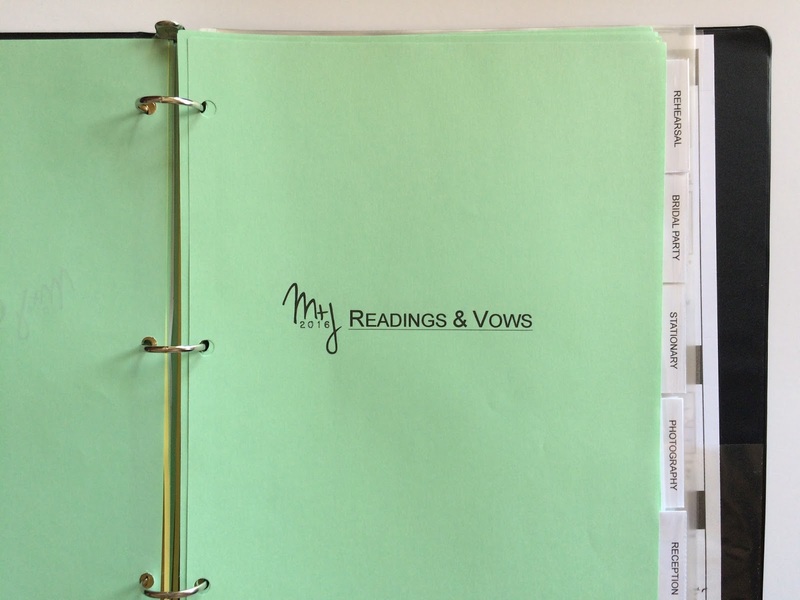 For some reason I had been really resistant about creating an actual planning binder, assuming that I could just do everything digitally and online and never bother printing anything out. Then I woke up from that delusion and put my stage management skills to good use (finally, a real-world application!) and compiled my binder. I'm now in a much better place to sift through the huge number of venue options we have (in two cities, no less) and get started on making some for-real decisions. 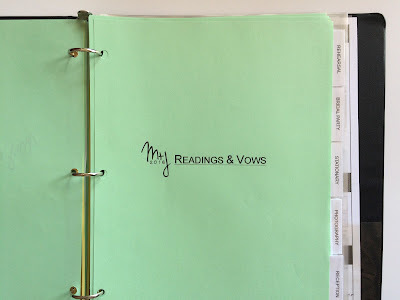 There's nothing special about this planner - I used a 1" black 3-ring binder I had on hand and clear plastic divider tabs and colored paper that I stole borrowed from work. 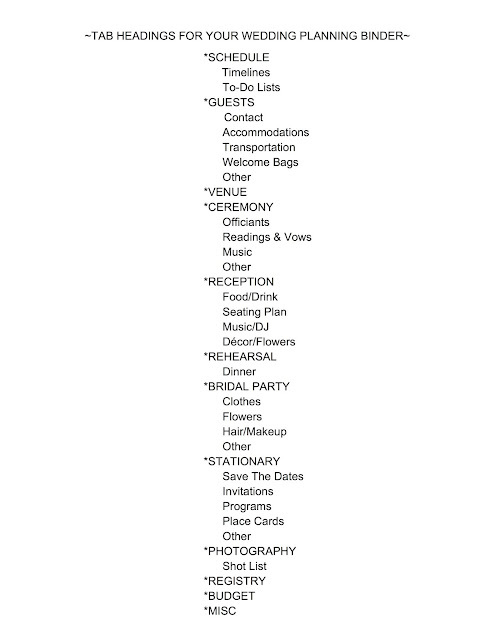 While there are countless numbers of specialty planners catered to wedding planning available for purchase, I decided to DIY this portion of the process, simply because Step #1 of Keeping My Wedding Costs Down is what I'm calling "Using What You Already Have to Make What You Need." There will be many things that I will obviously pay a premium for - venue, photographer, etc. Other things, like this binder, for instance, need not be an extra and/or exorbitant expense. 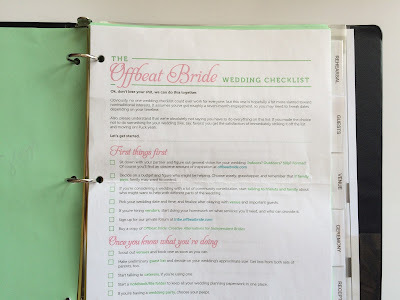 I hope this has been a help to you - and thanks for reading the first of many wedding-related posts as I begin to navigate the rugged territory of PLANNING A WEDDING! Glad the ideas helped - and here's to spreading the Packer love! I'm still in no binder land and convinced I don't need one lol but I'm sure I'll end up with one anyway lol. Great post though thanks for sharing. You forgot honeymoon and packing list. A folder for contracts & swatches would be good too. It is a colossal industry furnishing couples with a priceless administration amid a period in their lives when stress and stress ought to be exiled and time is of the embodiment. Then again, I know some genuinely well off individuals,san diego party rentals and I don't know any individual who didn't apprehension to a specific degree over the cost of their wedding.